When it comes to the hierarchy of Doctor Who companions, especially nuWho, Martha Jones tends to get lost in the shuffle. She’s not hated, like Rose sometimes is, or adored, like Rose sometimes is too. She’s not a champion for everyone, like Donna, or just freakishly adorable, like Oswin. She isn’t the Doctor’s best friend, like Amy, or blatantly nonplussed by the whole time-travel thing like Rory. And she isn’t Jack Harkness-y, like Jack Harkness, or perpetually undergoing an identity crisis, like Mickey (who I do actually love). Nope, Martha (played by the excellent Freema Agyeman) is just good. Just plain good. Okay, for starters, I straight up refuse to explain what Doctor Who is again. If you really don’t know, I recommend Wikipedia. But I warn you, it’s a long article. Martha was the Doctor’s companion in the rather lackluster third season of the new series. She followed after the aforementioned polarizing Rose Tyler (Billie Piper), whose departure from the show at the end of season two was pretty generally devastating. Martha was the show’s, and the Doctor’s, rebound girl. And as such, we never really got to enjoy how awesome she is. 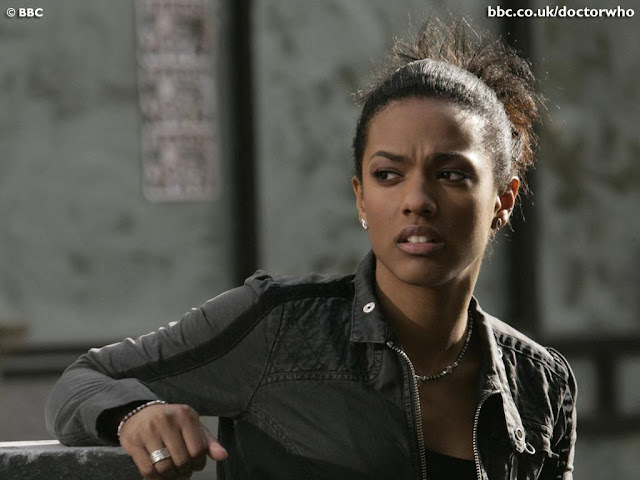 In start contrast to nearly every single other companion of nuWho (the revived series that came back on the air in 2005 after sixteen years of cancellation), Martha Jones is not at a loss for her life. She’s actually incredibly motivated. She’s a medical resident at a top hospital in London. She’s upper middle class, brilliant, and incredibly brave. When the hospital where she works is transported to the Moon as the result of an alien police standoff (not one of their easier episodes to explain), Martha handles the whole thing with grace, wit, and dignity. She’s a great help to the Doctor, managing to find clues that can solve the problem, and throws herself willingly and ably into the world of aliens and kooky space problems. She’s not lost, she’s just looking to explore a little. Unfortunately for her, and I do truly believe the writers did her a disservice here, Martha gets a crush on the Doctor. I mean, it’s understandable I guess (not a huge fan of Tennant, but whatevs). He is the Doctor. But after two seasons of out and out romance with Rose, the fans weren’t ready for the Doctor to move on. But here’s the catch: Martha is awesome. I mean really, really awesome. She’s a truly spectacular person. As my evidence, I present the two-part season finale (actually three parts, but I’m ignoring the first one – shhh). In this finale, the Doctor runs into his old frenemy, the Master, literally at the end of the Universe. The Master thinks he’s human, until he doesn’t anymore, and when he regenerates and remembers who he is, he freaks out and goes back in time to our time to run for Prime Minister and mess up everything. He also steals the TARDIS and calls the Doctor a few names. Back in our time, the Master makes Martha, Jack and the Doctor outcasts and hunts them. He then releases a deadly plague of angry alien orb-things to destroy and enslave the Earth. He puts Jack (who cannot die) under constant torture. The Doctor he keeps as his pet. But Martha escapes. She teleports back down to an Earth in flames, and just starts walking. It’s really that scene that gets me. Martha’s entire family has been captured by the Master. The only people she can think of to get the world out of this mess are captured or dead. She has nowhere to turn. And she starts walking. I’m being totally honest here, I’m pretty sure I would not have done that. It doesn’t stop there, either. The next episode zaps us a year into the future. Earth is mostly destroyed, the Master is building an army of warheads to declare war on the Universe, and everyone she loves is still in captivity. But Martha’s still going. In fact, she’s going better than ever. Instead of becoming hardened by all the tragedy, Martha actually looks more beautiful than ever. She’s not cynical, she’s determined. She’s literally walked across the entire world, dodging aliens and patrols and the Master’s minions. She goes places no one else will dare, and she just keeps going. And then she gets captured. Actually, that’s not even a fair assessment of the situation. She more gives herself up. They have the block surrounded, but the minions in question don’t actually know what Martha looks like. She could hide. The people she’s with are perfectly willing to hide her. In fact, she’s such an important figure to the resistance, that you know they would all rather die than give her up. Now, the rest of the episode is all about the cunning scheme she and the Doctor came up with (and it gets a bit silly towards the end), but the real beauty is, well, Martha. You see, we find out that she walked the entire Earth, risking life and limb, not to get a weapon, or foster a violent rebellion, or even trying to escape. Nope. She did it all to spread a message of hope. I can’t imagine being that brave on a good day, so it’s incredible to me to imagine doing it simply to talk to people and tell them about my hope. It is crazy. Flat out nuts. Insane. This is why I get so upset when people diss Martha, or, worse, forget her. Yes, all the other companions are great too, but Martha didn’t get to walk away from her problems. She wasn’t running alongside the Doctor. No, she saved the world in his place. And she did it without guns, or anger, or even a car. She told people about hope, and it saved the world. And then, in the end, she decided to finish her residency, take care of her family, and live her life on Earth. Not because she couldn’t hack it in space. Because she didn’t have to. She’d already proved she could hack anything put in front of her. 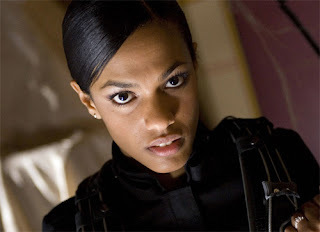 Martha Jones has nothing to prove. Dang. Okay, now I might have to actually watch an episode. The NuWho writers are also fond of giving godmode upgrades to their companions; Rose and Donna got big ones, and while Moffat has backed off from it a bit, Amy, River, and it looks like Oswin all have metaphysically unique attributes. By contrast Martha did all her world-saving off of her own grit. I do find the god-modding a little excessive, and Moffat's constant need to make his companions all mysterious and metaphysically "impossible" is super irritating. But I love that Donna was totes an awesome companion even before she got powers. Because she had the power of sass. Yep. I do love me some Martha... objectively, anyway. She has some serious feminist credentials. I think Donna is my favourite though. I never understood why so many fans dismiss Martha or actively dislike her. She was my favorite until Rory. Doctor 10 may not be your thing but he was a lot of people's. So many fangirls gush over Ten and yet look down at Martha for having romantic/sexual feelings for him. I mean, come on. If the fans can feel it of course the woman that is experiencing him first hand might. She was actually getting to travel in the TARDIS with him and was kissed by him (for the greater good). Why do people think S3 wasn't that great? It had so many of my favorite moments! How Gridlock was one huge Biblical metaphor/symbolization. The amazing Master (seriously, every scene with him) and his unhinged wife. The end of the universe. BLINK. William Shakespeare. The creepiness of how The Doctor dealt with the Family of Blood. The parts of S3 that pissed me off could actually be seen as showing my love for Martha. She got stuck twice in racist/sexist time periods having to be a waitress and then a maid (nothing wrong with those occupations but she was training to be a medical doctor). And as a maid had to watch the guy that was treating her as a rebound fall in love with another blonde white woman, one that was racist/classist/sexist.